Dala Paint Appeal is a peelable, water-based, non-toxic formula, ideal for children and crafters. The paint can be applied onto a non-porous surface directly from its applicator and then, after drying, peeled off and used to decorate glass windows, vases or any other glass-like surfaces. It is available in 10 colours: Red, Yellow, Blue, Green, Orange, Violet, Turquoise, Brown, Black and Lead. Roll Puff Paint with roller onto your surface / cardboard. Allow to dry. Puff the Paint with a heat gun or hold above hot stove plate. Stick twigs, shells and Paint Appeal fish on with Construction Glue. Allow to dry well. 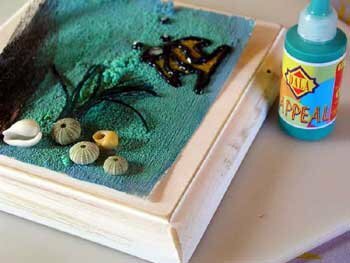 Seal the wooden block with 3 layers of Podge. Dry and sand between layers, adding (in between) layers of white Craft Paint. Dry and seal with another layer. Dry and sand with a fine sponge sander until wood shows through in places. Seal with 2 layers Dala Dead Flat Deco Varnish. Mount design on wooden block.